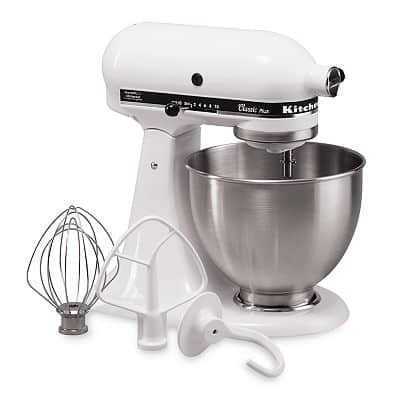 Gift Idea: KitchenAid Stand Mixer As Low As $102 From Kohls.com! If you've been waiting for an amazing deal on a KitchenAid mixer, Kohl's has one all lined up for you! Look for the white KitchenAid Plus 4.5 qt Stand Mixer that's on sale for $199.99. Plus, you'll get an extra 10% off that price because the Thanksgiving sale is going on! Add the mixer to your cart and head to the checkout screen. Enter Kohls.com promo code GOBBLE15 to get another 15% off. Your total cost today should be $152.99 plus a $3.25 shipping surcharge and your local sales tax. Your grand total after the rebate and Kohl's Cash is right around $102 after taxes! Finally, don't forget to shop through Ebates and get 4% cash back on your entire purchase! Even better, new users who sign up for a free Ebates account through this link will get $5 cash for FREE! On a personal note, I also want to add that I've had my own KitchenAid stand mixer for many years. It was a treat to myself after I got a promotion in my early working years. It's taken me a while to “get to know” my mixer, but it's truly an amazing piece of equipment, and it's just as valuable as everyone said it would be! If you like to bake yeast breads, I guarantee you'll wonder how you ever lived without the dough hook!